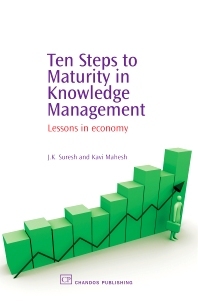 Part 1 Introduction: Knowledge management in practice: an introduction; The basic lesson – economy in knowledge management. Part 2 Strategy: Lesson 1: Economy of plan – adopt an evolutionary strategy; Lesson 2: Economy of change – be non-intrusive; Lesson 3: Economy of control – disempower the KM team. Part 3 Design: Lesson 4: Economy of scope – understand the knowledge dynamics of your organization; Lesson 5: Economy of effort – decentralize KM; Lesson 6: Economy in deployment – design an enterprise KM architecture. Part 4 Practice: Lesson 7: Economy in assessment – nurture a self-assessing quality system; Lesson 8: Economy in promotion – motivate through recognition; Lesson 9: Economy in evolution – measure from the start. Part 5 Future: Lesson 10: Look beyond KM; The final lesson: make KM a way of life. Dr J. K. Suresh is Associate Vice President and Principal Knowledge Manager at Infosys Technologies Limited. Dr. Kavi Mahesh is a KM consultant and the founder of EasySoftech, a company that builds software tools for knowledge management.